Like Chickens, turkeys are also a domesticated form of wild fowl. 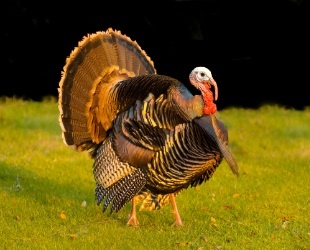 The wild turkey came from the New World and was brought to Europe by the Spanish. Turkeys in the UK are normally associated with Christmas, but good turkey is available all year round from Meat No Veg. The most important thing about turkey is to buy your bird form a butchers or a farm where you can be sure birds have been reared in natural conditions. Turkeys are available in many sizes, which will be determined by the age of the turkey and the flock it has come from. When selecting a turkey, our butchers examine the length of the breast bone and the amount of fat on the legs. They choose turkeys that are fresh and plump. Also, (as in chickens), look for skin and legs that are free of marks and blemishes. Find out more about turkey visit our 'how to roast a turkey' page.